A Tribute To Sir Terry Pratchett | Warped Factor - Words in the Key of Geek. Tony Fyler pays tribute to Terry Pratchett. When you’re in on the ground floor of something that becomes not only cool and mainstream, but gains surety, gains focus, and gains reliability the longer it goes on, it’s a wonderful feeling. I came to the work of Terry Pratchett when The Light Fantastic was released in paperback. Book two of the Discworld series, and at the time, you could still pick up The Colour of Magic at the same time. That was one entertaining weekend. Sure, Colour of Magic was a little bit scattershot, and didn’t really have too much in the way of a tight plot, but there was a sense there – a sense of something special. To a generation who were just understanding that the world – in fact, after Douglas Adams, the whole galaxy – was a pretty remarkable, funny place, and that that was wonderful, Terry Pratchett spoke at just the right time. We’d been primed with the likes of Bananaman and Danger Mouse, we’d read the books, and if we were lucky, heard the radio show of Hitch-Hikers, we identified with a sideways way of looking at things. The Monty Python team and the Goodies were still in the air, but there was a way of telling stories that was like them, but not them – ways that were like most of Life of Brian, or most of the Holy Grail, only with a bit more oomph and without quite as many tiresome tangents. We were ready. Terry Pratchett was, to some extent, the answer to what we knew we needed, but didn’t know was out there. He was a sarky git for a generation of sarky gits, a kind of Breakfast Club Kid cult, and we adored him for it. While there was comedy gold in the first two books – Rincewind the ‘wizzard’ and the continuing joy that is The Luggage particularly, along with Pratchett’s universally acclaimed personification of DEATH – the Discworld series really began to hit its stride with book three, Equal Rites, with book four, Mort beginning the first truly golden period of his writing. Pratchett of course was about more than the Discworld – he was unafraid to make his voice heard on a wide range of subjects, was a keen gamer, and embraced the fantasy community as a whole. 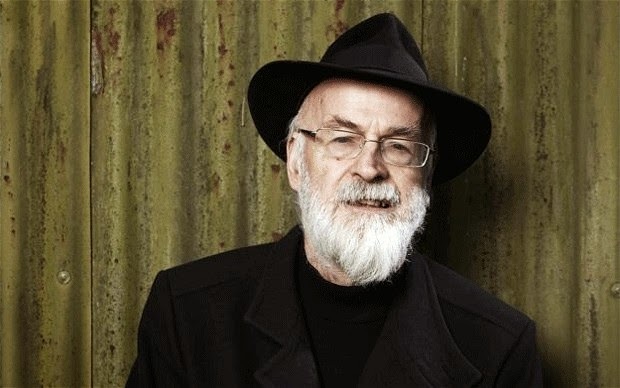 He wrote for young adults as well as ‘Pratchett fans’, set up a biannual first novel prize with his name on it, and when diagnosed with the Alzheimer’s Disease that would eventually take him from the world, he defined it in a typically funny way as ‘an embuggerance’ - and then campaigned not only for Alzheimer’s research, but for the right to a dignified, self-determined end to life – a campaign which has yet to be reflected in law. Through the work of his writing life, Sir Terry Pratchett became that most amazing thing – a literary certainty that lifted your spirits. Any day, any godawful train delayed, pouring rain, hate you all day, he was there. In any Smiths, for a small amount of money, on any Kindle, on any phone, Pratchett was there, and which book you chose didn’t really matter that much. Chances are the first paragraph would make you laugh. Certainly, within the first two pages, you’d be apologizing to people around you. And whatever the day would go on to throw at you mattered less, or mattered not at all, because Pratchett would lead you away from your troubles, would give you a guaranteed laugh, would make you think, and then would make you laugh a whole lot more before you closed the book. During the ‘first golden period’ – from Mort to about Witches Abroad (eight books where he barely put a foot wrong) – journalists would frequently say he was ‘the funniest writer in the English language since PG Wodehouse.’ Then journalists stopped saying that, because it became clear that actually, he was probably the funnier of the two, his scope much broader, his characters more believable while still delivering the laughs. Twenty years ago, when I was first trying to become a comic fantasy writer, I had the enormous privilege to be described by some publishers - proper ones, from MacMillan, and Harper, and Orion, no rubbish - as being potentially ‘the next Terry Pratchett’. At the time, I wasn’t sure how to take that – I was young and stupid, and not quite ready to see it as the compliment it was. But one thing was clear to me even then, and it went on to be proved as true for the next twenty years, (as his consistency, his comedic kindness and his deliciously witty take on the world buried many another writer prematurely given the title of ‘the next Terry Pratchett’) as it was when I quipped straight back to them without thinking about it. We’ll miss the one and only Terry Pratchett in our lives. But open up any one of his books, and there you’ll find him, any day when you need to laugh a bit more. Sadly missed, hysterically remembered: Terry Pratchett.